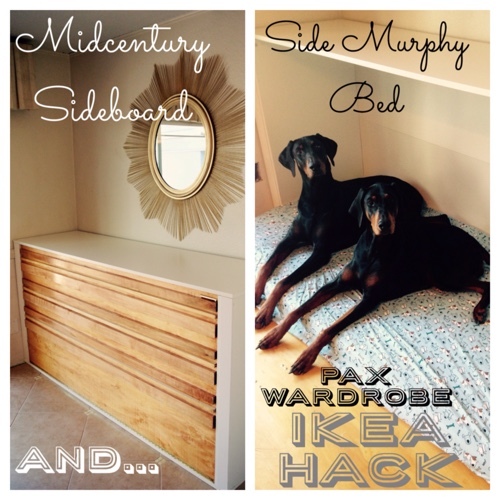 This entry was posted in Projects, Uncategorized and tagged diy, dog bed for two dogs, dog murphy bed, Ikea hack, midcentury buffet, pax wardrobe, side murphy bed, sideboard by Tandra. Bookmark the permalink. My question is….do you know of another IKEA piece that would work in place of the wardrobe? I don’t know that I would be so lucky to find what you found in the AS IS section. Aww thanks! That warms my heart! Hmmm, well I know they always have these wardrobes in my local (Sacramento) ikea’s “as is” section. I’m hoping you find one too☺️Hmm maybe the malm dresser but without the drawers? Any wardrobe or dresser may work, depending on your dog bed or mattress. Hi! These are great ideas. I’m wondering, can you possibly provide links to the products you used? I’m not sure what size mattress from Ikea you had or which of the PAX systems you used to create this. Would love a bit more detail before starting to recreate. Thanks! Hi Elizabeth, We used a Pax wardrobe frame, in the discounted/”as is” section. Based on the dimensions this is the closest online http://www.ikea.com/us/en/catalog/products/50214560/. However we also customized the Pax by adapting the set-up to fit the plywood we had on hand and our space requirements. (So dimension will be based on your personal needs) I also used the mattresses that fit the Hemnes daybed and I think they are Meistervik and Minnesund. Good luck with your project!